Natural Star Nani, “Vaishakam trailer is very good. The title itself is generates positive vibes. It is so good. I thought this is a soft love story based on the title but the trailer makes it clear that it is a perfect commercial entertainer. I wish the movie is a big success and brings lots of name to BA Raju garu and B Jaya garu. BA Raju garu is a passionate movie lover with great information about them. I have been observing Jaya garu right from the days of assistant director, she did many movies back then and they were all success. Vaishakam will also be a big success. In my opinion there is no Lady Director or Gent Director, a director is a director and that’s how it should be. We should stop treating Lady Director as separate entity. I wish all the best to cast and crew of the film for a big success”. Dynamic Director Jaya B, “I liked Nani from the beginning, he gives very natural performance. I missed working with such natural performer in the past, but will surely plan something for him in the future. Many don’t know that I edited the movies Lovely and Vaishakam. It is very rare for a women director to edit the film. Vaishakam will entertain all segment of audience”. Producer BA Raju said, “Ashta Chemma, Majnu and now Ninnu Kori, I am the PR for the movie. Nani has grown tremendously as a star and yet he is still the very simple and humble. He is selecting nice scripts selectively and delivering success continuously by keeping the audience happy. There is a universal feeling among the producers regarding Nani as a minimum guarantee hero. 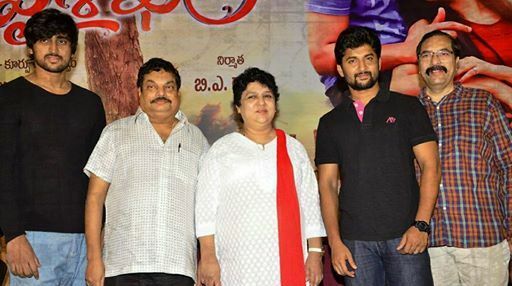 Producers feel they are already in safe zone with Nani as hero in their films. He is increasing his range with each new film of his. Right now he is busy with the shooting of MCA. We are happy and thankful that Nani made time to release the trailer for us despite his busy schedule. Superstar Mahesh Babu released the audio which is Superhit. We are hopeful that trailer will get similar response. We are planning to release Vaishakam in the first week of June”. Kashi Vishwanath, “I am very happy and lucky that this is the 100th movie of my career. The movie will be a big success. Audio of the film was released by Superstar Mahesh Babu and it is a big success. Now the trailer is unveiled by Nani, it will also get a big response”. Harish playing the lead in the movie echoed similar sentiments and thanked producer BA Raju garu and Jaya garu for giving such a wonderful film. Cinematographer V Subbarao further stated that he was given superb encouragement and freedom while working which resulted in this wonderful output.